Oh yes, trading can do wonders for the ones who are disciplined, willing to pay their dues and work as a bricklayer doing the same thing everyday, certain that it's just a matter of time until they can reach even their wildest targets, all they have to do is plan the road ahead and travel safely all the way to their destination. We know there are lots of pitfalls along the way and we need to be aware of changes of conditions in the markets, sometimes we will be able to make a killing in the markets such as on the period between August and November/2011 when the volatility went wild and we were able to make a great deal of points when trading the SP500 e-minis, 20 points and more were common on most of the weeks during that period for any day trader with a good strategy, but things already started changing in December with tighter ranges making it more difficult to grab fat profits, so let's wait and see if the return of volume to the market will bring the volatility back or will we continue into a period of tighter ranges in the beginning of the new year? No matter how the market behaves, we, day traders, will have to continue patient and disciplined waiting for the good setups to show up and only trade when they do, we will not force trades as we know they have a good probability of failing, we want the high odds trades only. So, what exactly do I mean when I say: "do the same thing everyday"? When you use a trading system you know the market will repeat a couple of patterns everyday, traders will show their greed and fear and that is what will make the market move the prices up and down, so your job is to wait until you see a "good setup" and make sure you pull the trigger when you recognize it, because you know that in more than 80% of the time that trade will be a winner or you will be ready to lose in case your STOP gets hit and you will patiently wait for the next setup, so it's the very same thing everyday, you just need to follow the system and you know that in the end of the day you will be profitable, we work with probabilities and we know what to expect. One important thing to observe is to make sure you have your targets set for the day, week, month, year and a long-term one, where you want to be in 5 or 10 years from now, and also that you will increase the size you trade by the time you reach the key targets as I have explained in my previous blog post. So, kick start the year doing the right thing and by the end of this year you will be rewarded with a good harvest, paying off for all the hard work you've put in during the whole year. - If you don't have a plan on how you will trade, a plan you know that works most of the time, it'll be really hard to achieve consistent results, so make sure you create your own system or buy one from a reliable system vendor, as you probably know, I have put together a really simple system, easy to learn and use, the Diamond Setups. - Trading futures with a Forex account will make it almost impossible for you to be successful, competition is stiff, you need the best tools, make sure your broker is a specialist in futures, there are many good platforms out there, find one that will fit your trading style. Same with the charting software, make sure you get one that is flexible and that will allow you to customize it to fit your needs. - Of course if you will be day trading you need a reliable internet connection, make sure you get the best money can buy and also have a second one available in case the main one fails, it might be either a 3G connection or even a dial up emergency connection so that you will not be totally in the dark. - If you trade from your garage or from the basement, make sure you have created a properly set up office space, with good lighting and well organized, it's hard to do the right thing if you're trading locked in a cubicle. If the place is noisy, with your neighbor's dog barking all the time, that might bother you and influence on your trading, pay attention to the small little things. - Most of us have some "friends" who will always want to make fun of you when you start trading for a living, don't let them spoil your weekend as that could last the whole week and make you have a bad week, your state of mind is really important, get rid of those types... OH! Is it your wife/husband who says you can't? No one can stop you when you know where you want to get. - As Warren buffet says: "I don't know a single rich person who doesn't like reading". You need to read to learn how others have succeeded in this business and follow their example, so make sure you read the good books available out there. On the right side of my blog I have a list with the 10 books a trader must read, there are many other good books, of course, but those 10 are definitely must reads. - And last but not least: Be disciplined with your trading this year, if you do the right thing every single day the rewards will show up automatically, you don't have to think about your profits, just make sure you trade well and the money will come to you. You will never be able to do good while you're failing to pull the trigger on good setups, or getting out of a trade without being stopped out, or by taking profits too quickly instead of letting your winners run, these are only a couple examples, you will never regret you were disciplined by the end of this year. Maybe you think it'll take too long until you become a millionaire, but maybe you're wrong. 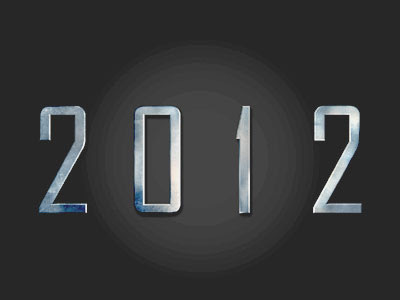 Wishing you all the luck in your trading in 2012.